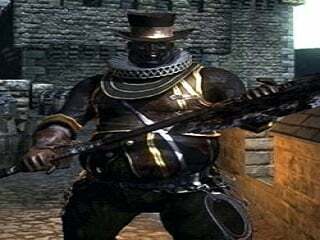 Fat Official is an Enemy in Demon's Souls. Demons in the form of obese, gray-skinned men whose faces are perpetually wrinkled with wide, black-toothed grins. Nevertheless, they dress in rich black and gold outfits and carry whips and large two-handed gisarmes, symbols of their ruthless authority. They frequently emit a deep, distinctive chuckle, even while dying. Favours melee attacks. Will jog towards the player. Jumping overhead two handed chop. Careful now. The forward hop isn't clearly telegraphed. These distinctive, portly, laughing demons appear in Stonefang Tunnel and Boletaria Palace. Look for bad taste in clothing with a funny hat and ugly grin. Slow to move, they instead use their own version of the Flamethrower spell to attack you at long range. With decent defense and high health it can take a while to whittle these guys down. At melee range they will attack with their weapons, usually a flexible metal whip or axe. Sometimes they will use the spell at melee range too. They also have a habit of blockading narrow areas and being a general nuisance. If possible, quickly circling them will let you avoid most of their attacks and get in that critical back stab. When possible, lock on to them and try to keep them behind an obstacle but a couple of meters away from you. When they do the flame attack, let it hit the obstacle and dash in for a strong attack before getting into cover again. Rinse and repeat and they'll never cause you trouble again. Don't go toe-to-toe with them unless you're got a fire resistance ring and are quick moving. Since they are slow moving, you can control the distance and use hit and roll or range attacks effectively. Also note that works well on them. They continue trying to cast spells, but the spell just fizzles, leaving them open for attack. This is a particularly poorly written page. Why is nothing here proofread?